Osprey, photographed at Military Trail Natural Area in Deerfield Beach. Ospreys, Pandiion haliaetus, are the world travelers among hawks, often flying from one end of the hemisphere to the other, from the Arctic to the pampas of Argentina and back during their twice-yearly commute. But Florida is an exception. 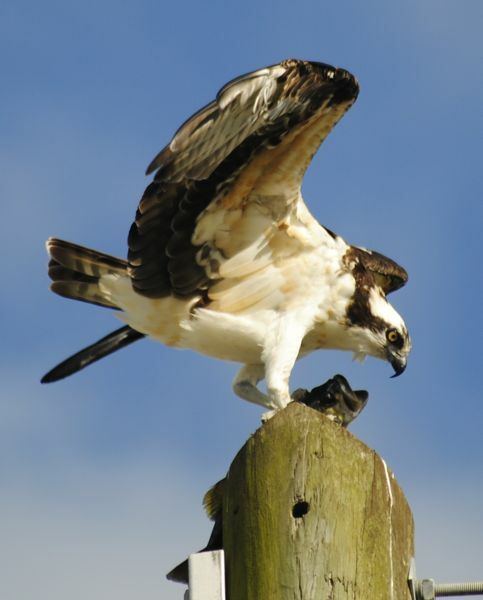 Ospreys areyear-round residents of the Sunshine State, and a common sight near open water. They'll perch and nest atop dead trees and electrical poles eating one meal or waiting to catch the next. Their huge stick nests are easy to spot. They eat mostly fish and are amazingly efficient at catching them — according to Cornell Labs, it takes an osprey on average about 12 minutes of hunting to nab a meal. They have a reversible toe and barbed pads on their feet to help them catch and carry their prey. Ospreys will on occasion down a bird, small mammal or snake. Its size, hooked, raptor's bill and dark mask around the eyes and side of head and neck distinguish the osprey from other hawks. Their fish-heavy diet and their ability to dive into water to catch their prey are also unique in the hawk world. At a distance, ospreys appear to be black and white, but seen up close, the dark portions become shades of brown. They're similar in appearance to the bald eagle, but ospreys are smaller and lankier than the eagle. The white underside separates the two — ospreys are the only raptor so marked. Both birds occupy similar habitats, and can compete for food. Eagles will force ospreys to drop their catch, then dive and pluck the fish in mid-air. Ospreys can reach nearly two feet in length, their wingspan nearly six feet. Ospreys range over most of North America, coast-to-coast, and winter as far south as Argentina and Chile. Florida is among the few spots on the map where they live year round. Ospreys are found on every continent except Antarctica. 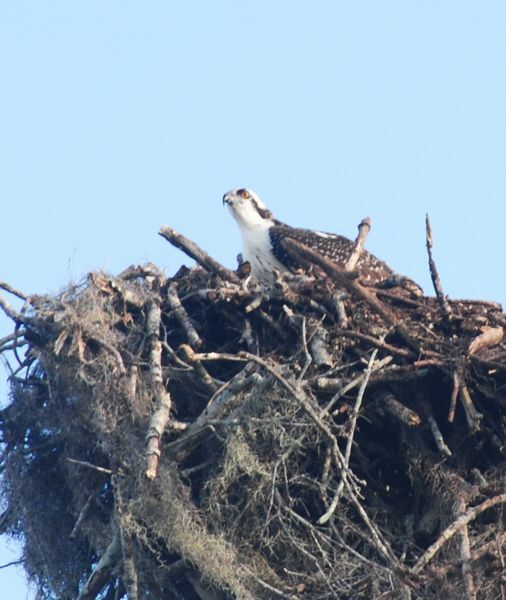 Ospreys nest within 12 miles of a source of food — a body of water with plenty of fish. Nest are built of sticks and lined with bark, grass, vines and other soft material. Males gather the material; females arrange it. They typically raise one brood a year; females usually lay a clutch of three eggs, which can take as long as six weeks to hatch. Both parents take turns sitting on the eggs. The eggs are layed over a period of days, meaning the young emerge over a period of days, giving older hatchlings an advantage over their younger brothers and sisters. It's not a problem if food is plentiful, but if times are hard, the younger chicks can starve to death. Young ospreys can be in the nest nearly two months. It is a fairly common bird to spot, but a cool one no matter how many you've seen before. At one point in the 1950s, ospreys where critically endangered from pesticides and other pollutants, but their population has rebounded significantly with the passage of environmental protection laws, particularly the ban on DDT. Ospreys are members of Pandionidae, the family of ospresys. Other names include sea hawk, fish hawk, river hawk and fish eagle. It is the provincial bird of Nova Scotia.